The “Best of New York Week” Travel Blogger Link-Up! We’ve made our contribution to the Red Cross. We’ve brought diapers and supplies to the local collection point. We’ve waited patiently in line at the gas station, as shortages hit the mid-Hudson Valley. 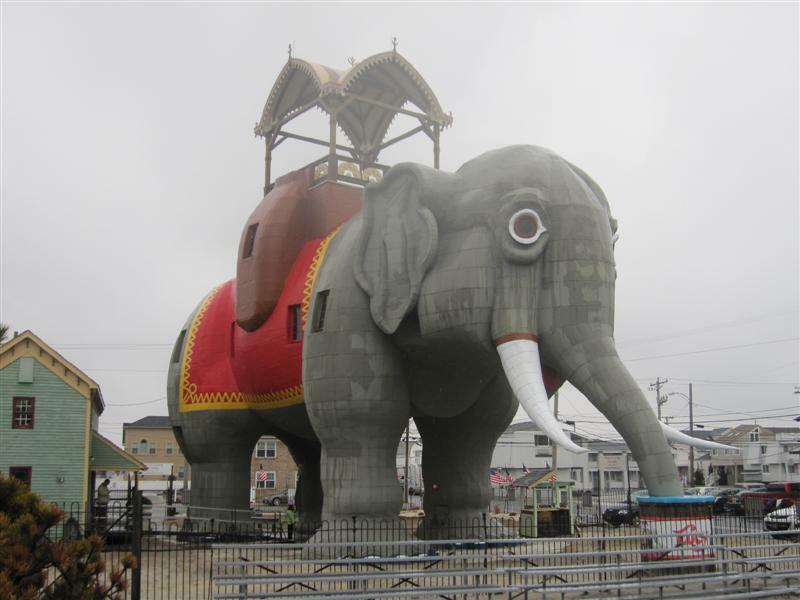 The effects of Superstorm Sandy are still raw, and for many, normalcy is far, far away. But I can’t keep from looking ahead, at the long-term fall-out from this devastating event. With my background in tourism destination marketing, I wonder how this storm will affect incoming visitation to New York State. 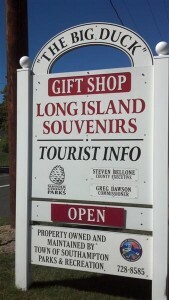 Tourism is one of the state’s largest economic engines. Will potential visitors who are unfamiliar with the state’s geography think the entire state is out of commission, and make plans to go elsewhere? After Hurricane Irene hit New York last year, I dedicated a post to all the BIG things to love in New York which we’ve visited for this blog, like the world’s largest toy store, the world’s largest indoor theater, the world’s largest collection of glass, and the world’s largest pancake griddle. There are so many great travel stories to tell about New York State. So I’m asking my fellow travel bloggers to link here with me this week, to share their tales. The Adirondacks, the Finger Lakes, the Thousand Islands region, Niagara, and (most of) the Hudson Valley…all of these destinations escaped major harm, and are ready now to welcome visitors. I was born in Queens, partially raised in Long Island (where many of my family members are now dealing with the storm’s after-effects), and have been a Hudson Valley resident for almost 20 years. I’m proud to call New York home, and know we’ll bounce back, stronger than before. 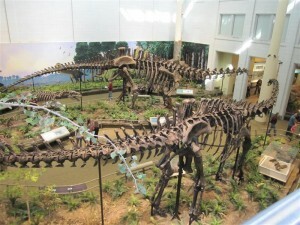 If you have a blog post about a trip you enjoyed anywhere in New York State, please link up below. And please let others know this list is here, for anyone who wants to see the selection of amazing things to do and see in New York! Because we ♥ New York, now more than ever. 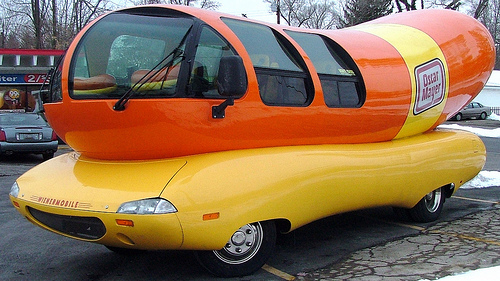 The Wienermobile, Bootmobile, and other BIG Things on Wheels This Year! Of course, you are all familiar with the Oscar Mayer Wienermobile, that icon of American pop culture history. Personally, I think it’s adorable. Not only is this BIG hot dog on the road this summer and fall, but other BIG things as well, including the L.L. 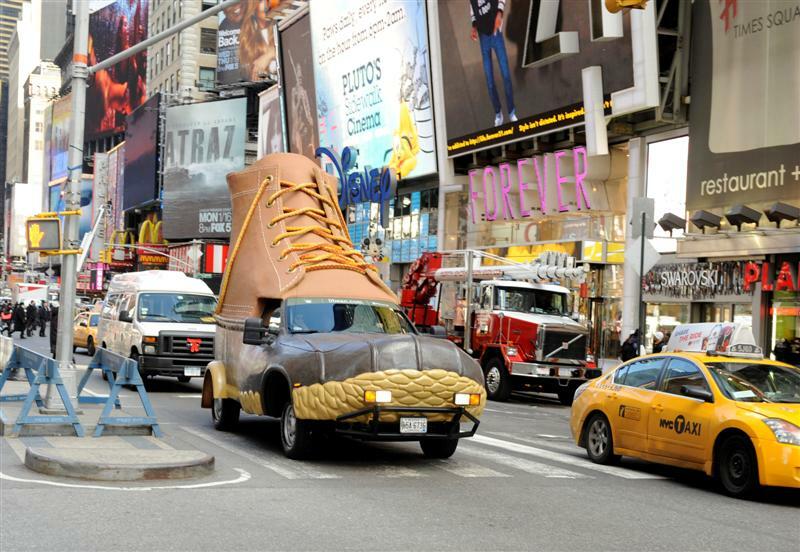 Bean Bootmobile, the world’s largest potato, and the Butterfinger van. I know you’re intrigued, so read on! When we went to Maine two years ago for my college (cough)-tieth reunion, we stopped at the L.L. Bean flagship store in Freeport. The Boy hammed it up for the camera, posing under the 15-foot boot as if he would be smooshed. Hopefully, you’ll be able to catch it, and report back to me with photos. Track it on its website or the L.L. Bean Facebook page. This is fun! 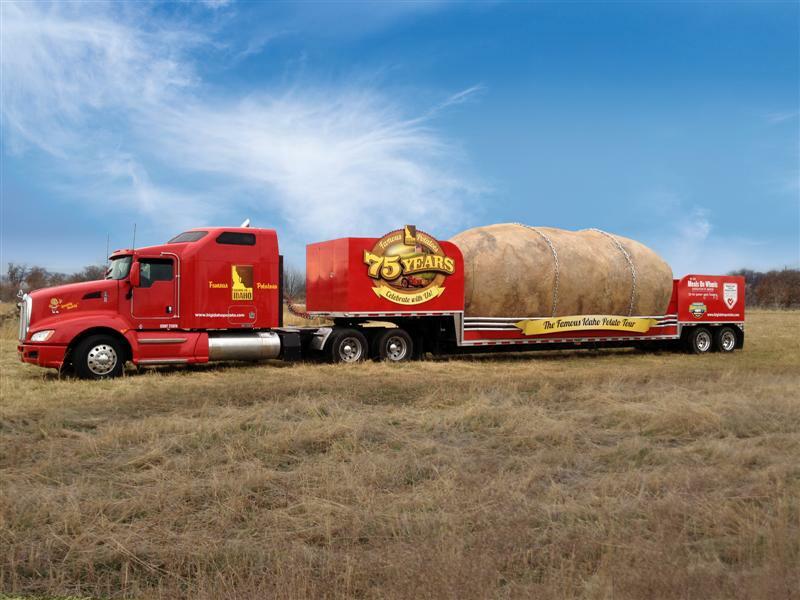 The world’s largest potato is touring the U.S. to celebrate the Idaho Potato Commission’s 75th anniversary. The Famous Idaho® Potato Truck is traveling coast to coast in 2012, stopping in large cities, supermarket parking lots, and at special events. Currently, the truck is on the East Coast, and although we missed the New Jersey appearances, it’s likely we’ll be able to catch it in Orlando on the 25th! The world's largest potato, on tour! On the flatbed sits the super-sized spud — a 12,000-pound russet potato, equal to 32,346 medium-sized potatoes. Of course, it’s not a real potato. This replica is 1,102 times heavier than the largest potato ever grown, which weighed 11 pounds. The website and Facebook page provide dates and locations for the immediate future, but it’s constantly updated as they get permits for showing up at places with a six-ton potato. BUTTERFINGER® candy bars…mmmmmm. The company’s new promotion is playing up the end of the world, counting down the days to the Mayan prophecy predicted for December 21, 2012. 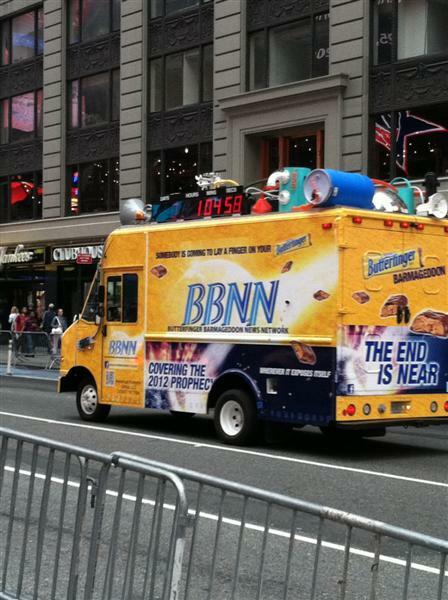 The Butterfinger BARmageddon News Network (BBNN) van is on a nationwide tour to collect evidence that the end is year, like crop circles and UFO sighting locations. 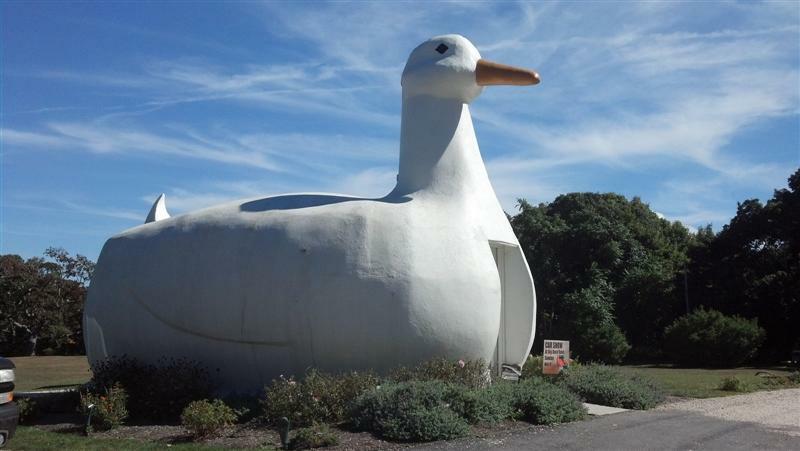 I wish they would have invited me along, because the BBNN news van is stopping at the country’s kitschiest roadside attractions and unexplained mystery sites, including Roswell, the Petrified Forest in AZ., the Blue Whale in Catoosa, OK., and the world’s largest basket in Newark, OH. You can watch the footage of their interviews and stories here. If you spot the van, say “hi” and try a sample of Butterfinger Bites. I didn’t realize that there are currently eight active Wienermobiles, with each assigned to cover a different part of the U.S. The first Wienermobile was created in 1936 by Oscar’ Mayer’s nephew, Carl Mayer. The design has changed over the years, but the main component, a hot dog on wheels, is still part of its charm. Drivers of the Wienermobiles are known as Hotdoggers. Unfortunately, I do not qualify for the position, which is only open to college seniors. You can keep up to date with Wienermobile appearances on Facebook, Twitter, and the Hotdogger blog. Regrettably, the company did not respond to my requests for upcoming appearance dates or photos. 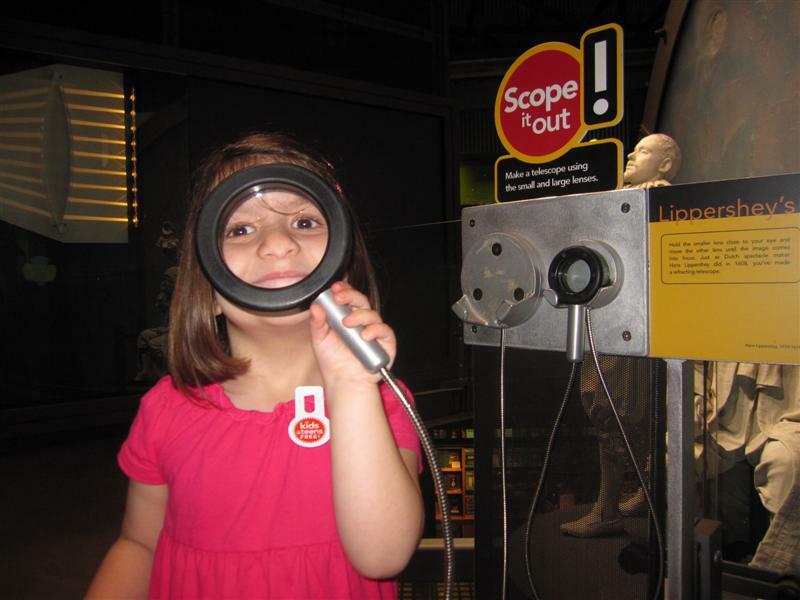 Occasionally, we diverge from the telling of BIG adventures to present family travel tips, based on our own experiences. We’ve suggested technology to facilitate travel, and great places to eat on the road beyond traditional restaurants. 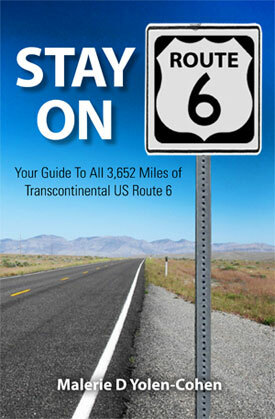 We’ve even warned you about road trip mistakes. This week, we offer our own suggestions on how to find a family friendly hotel, as well as ideas from other family bloggers. 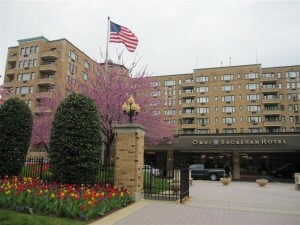 Over spring break, our family stayed at the Omni Shoreham hotel in Washington, DC. This property, in my opinion, sets a gold standard for kid-friendly accommodations, so I’ll use it as an example in many of the following points. Hotels can be upscale, grand, and historic, and still be casual enough for kids. The Omni is a stately “grand dame” among hotels, and yet, we never felt self-conscious about bringing the kids through the lovely lobby. It helped that The Girl did not have any public meltdowns. (For a change.) Not only was the staff very friendly, they delivered milk and cookies for the kids during the turn-down service. When on the road, the pool is the first and foremost amenity my kids want in a hotel. Indoor, outdoor, any shape or size will do. Swim time means blowing off steam, or winding them down for bed, or just spending some time NOT in an expensive theme park. We were fortunate that our Omni stay coincided with the seasonal opening of its outdoor heated pool! 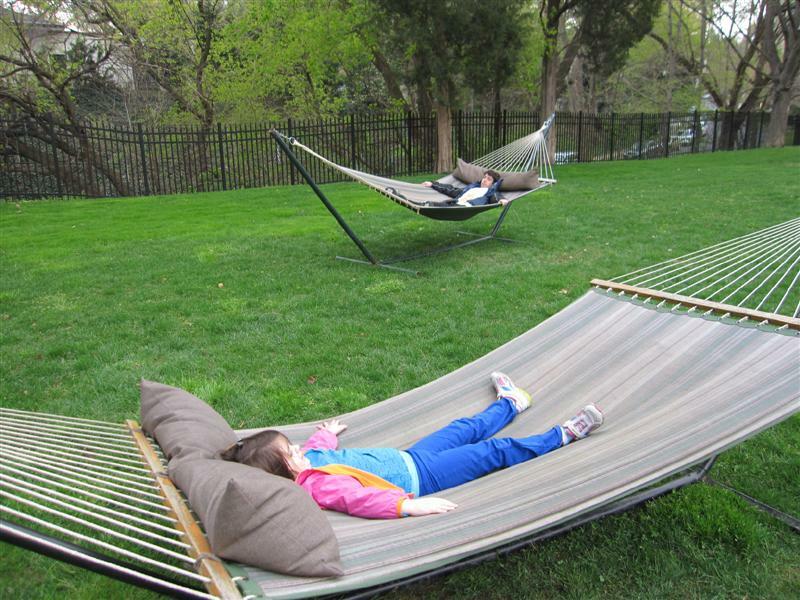 A lawn, garden, or ideally, a playground, is also a big plus. "I'm not getting off this hammock anytime soon, just FYI." At the Omni Shoreham. I need to stop looking at the brochure racks in hotel lobbies. 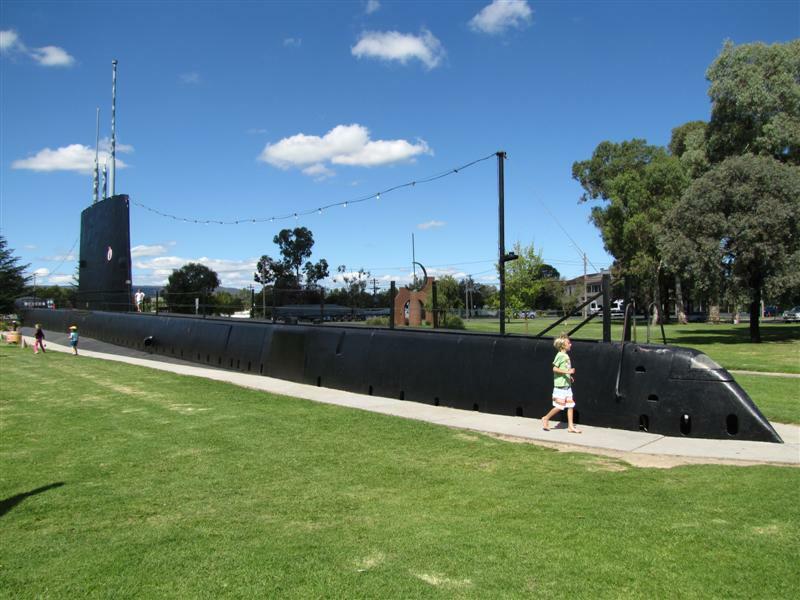 I end up finding places we HAVE to visit on our trips which aren’t on our itinerary. These places usually involve retail, and they make Matt very nervous. Like our November detour to the world’s largest candle store in MA. This time, it was the world’s largest shoe store, and I was able to convince him that it was on our way home from Pittsburgh. I wasn’t entirely truthful, but how could we NOT visit? I did it for YOU, dear readers. You’re here to read about world’s largest places, are you not? And so, we must make sacrifices. We headed north to Sharon, PA and spent an hour in Reyer’s Shoe Store. It was an add-on to our long weekend in Pittsburgh. Matt said he wouldn’t go unless I posted it on our Facebook page, and got at least 10 “likes.” We got 20 likes there, and another 17 on my personal account. Heh. The kids did actually need new shoes. Especially The Boy, who insists on growing. Rapidly. Matt needed sneakers. I needed nothing in the way of footwear, but that’s never stopped me before. 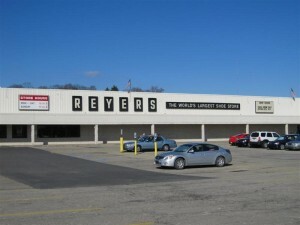 At 36,000 square feet, Reyer’s Shoe Store is indeed BIG. 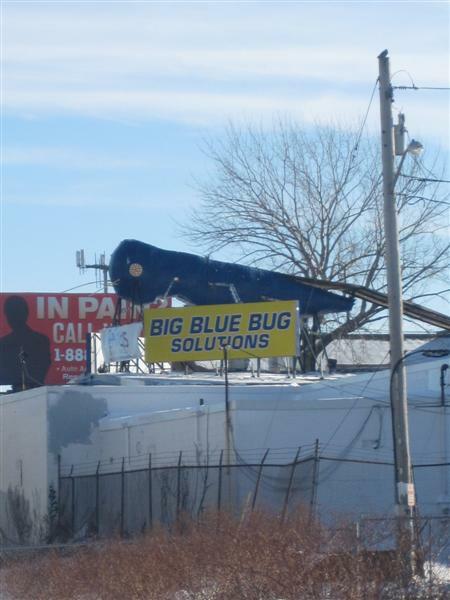 The size doesn’t translate into the world’s largest selection, however. Although the brochure claims the store has over 100,000 pairs of shoes and boots, there was a lot of wide open floor space. The décor is a little timeworn, but The Girl was truly digging the pink shag carpet in the woman’s department.